There has always been a search for adjuvants to the regional nerve block with drugs that prolong the duration of analgesia but with lesser adverse effects. The search for the ideal additive continues, and led us to try the novel α2 adrenergic agent, dexmedetomidine. Dexmedetomidine, a potent α2 adrenoceptor agonist, is approximately eight-times more selective towards the α2 adrenoceptor than clonidine. In previous clinical studies, intravenous dexmedetomidine resulted in significant opioid sparing effects as well as a decrease in inhalational anaesthetic requirements. In various animal studies, dexmedetomidine has been reported to enhance sensory and motor blockade along with increased duration of analgesia. ,,, In humans, dexmedetomidine has also shown to prolong the duration of block and post-operative analgesia when added to local anaesthetic in various regional blocks. ,,, Till date, no studies have compared dexmedetomidine with clonidine with respect to duration of block and post-operative analgesia. The current study was designed to test the hypothesis that dexmedetomidine when added as an adjuvant to local anaesthetic in supraclavicular brachial plexus block enhanced the duration of sensory and motor block, duration of analgesia and quality of block as compared with clonidine. Patients on adrenoreceptor agonist or antagonist therapy, with known hypersensitivity to local anaesthetic drugs, bleeding disorders, uncontrolled diabetes mellitus, pregnant women and pre-existing peripheral neuropathy, were excluded from the study. On arrival in the operation room, baseline heart rate, blood pressure and oxygen saturation were recorded. An intravenous line was secured in the unaffected limb and Ringer's lactate was started. All the patients received brachial plexus block through the supraclavicular approach by an experienced anaesthesiologist different from the one assessing the patient intra- and post-operatively. Both were blinded to the treatment groups. Neural localization was achieved by using a nerve locator (Fisher and Paykel, New Zealand) connected to a 22 G, 50-mm-long stimulating needle (Stimuplex, Braun, Germany). The location end point was a distal motor response with an output lower than 0.5 mA in the median nerve region. Following negative aspiration, 35 mL of a solution containing local anaesthetic combined with clonidine or dexmedetomidine as mentioned above was injected. A 3-min massage was performed to facilitate an even drug distribution. Sensory block was assessed by the pin prick method. Assessment of sensory block was done at each minute after completion of drug injection in the dermatomal areas corresponding to median nerve, radial nerve, ulnar nerve and musculocutaneous nerve till complete sensory blockade. Sensory onset was considered when there was a dull sensation to pin prick along the distribution of any of the above-mentioned nerves. Complete sensory block was considered when there was complete loss of sensation to pin prick. Grade 2: Anaesthesia, no sensation felt. Assessment of blood loss was done and fluid was administered as per the loss. Duration of surgery was noted. The intra- and post-operative assessment was done by an anaesthesiologist who was unaware of the drug used. Patients were assessed for duration of analgesia as per a numeric rating scale of 0 to 10. The numeric rating scale was recorded post-operatively every 60 min till the score of 5. The rescue analgesia was given in the form of inj. diclofenac sodium (1.5 mg/kg) intramuscularly at the Neumeric Rating Scale of 5 and the time of administration was noted. All patients were observed for any side-effects like nausea, vomiting, dryness of mouth and complications like pneumothorax, haematoma, local anaesthetic toxicity and post-block neuropathy in the intra- and post-operative periods. 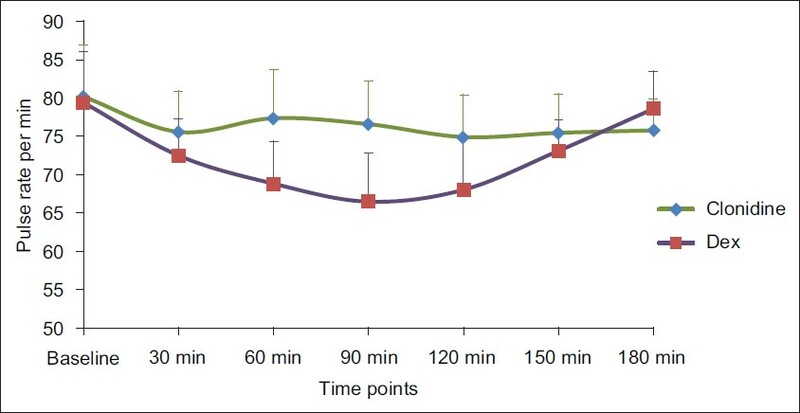 The duration of sensory block was defined as the time interval between the end of local anaesthetic administration and the complete resolution of anaesthesia on all nerves. The duration of motor block was defined as the time interval between the end of local anaesthetic administration and the recovery of complete motor function of the hand and forearm. The data was analysed by SPSS version (Statistical Package for Social Sciences) software. Unpaired t-test was applied for demographic data, haemodynamic parameters, onset and duration of sensory and motor blockade and duration of analgesia. Fisher exact test was applied for assessment of quality of block. P-value was considered significant if <0.05 and highly significant if <0.001. Eighty patients posted for upper limb surgeries were assessed for suitability to enroll in the study. Seven patients declined to participate in the study. Five patients were excluded as they were posted for soft tissue surgeries of the upper limb. Eight patients were excluded as they were found to be on beta blockers, anticoagulation drugs and had uncontrolled diabetes mellitus. The remaining 60 patients fulfilling the inclusion criteria were randomly assigned to one of the two groups. There was no protocol deviation pre-operatively and intraoperatively, except for one patient in group C who had to be given general anaesthesia for inadequate block. Both groups were comparable in terms of age, gender, weight and type of surgeries [Table 1] (P>0.001). The baseline haemodynamic parameters were comparable in both groups. Significantly lower pulse rate was observed at 60, 90 and 120 min, but not less than 60 beats/min, in Group D as compared with Group C [Figure 1] (P<0.001).Systolic and diastolic blood pressure were found to be significantly lower than baseline from 30 to 120 min in Group D as compared with Group C (Graph II) (P<0.001). No treatment was required for this fall in blood pressure. The haemodynamic parameters were comparable at the end of 180 min. [Figure 2]. 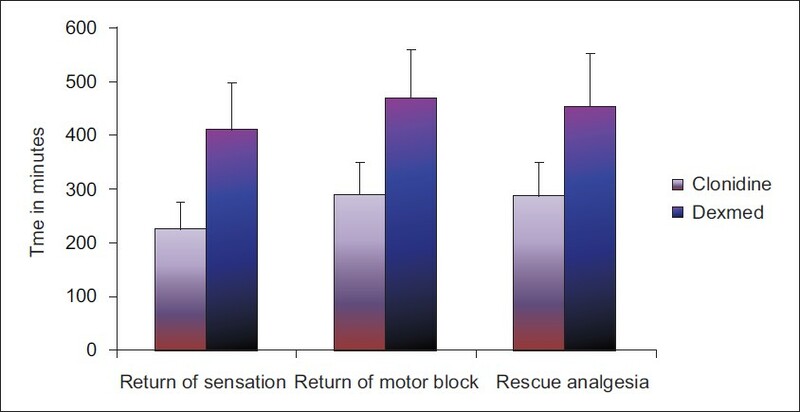 Onset of sensory block was faster in Group D than in Group C, while onset of motor block was faster in Group C than in Group D, but the difference was not statistically significant [Table 2] (P>0.001). Duration of sensory block was 227.00±48.36 min in Group C as compared with 413.97±87.31 min in Group D. Statistically significant longer duration of sensory block was observed in Group D [Table 2] and [Figure 3] (P=0.001). 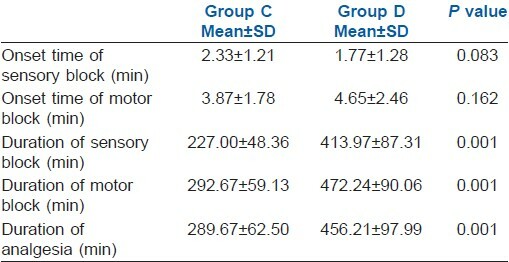 The duration of motor block was 292.67±59.13 min in Group C as compared with 472.24±90.06 min in Group D. Again, duration of motor block was significantly longer in Group D [Table 2] and [Figure 3] (P=0.001). In Group D, 80% of the patients achieved Grade IV quality of block as opposed to 40% in Group C (P<0.05). There were a total 17 patients in Group C with Grade II and III block and six patients in Group D who required sedation or sedation with analgesia. One patient in Group C required general anaesthesia as the block was inadequate [Table 3]. No side-effects (nausea, vomiting, dry mouth) were reported during the first 24 h in the post-operative period in both the groups. In this randomized, double-blinded trial, we compared dexmedetomidine and clonidine (α2 agonist) as an adjuvant to Bupivacaine in supraclavicular brachial plexus block, and found that there was a significantly increased duration of sensory and motor blockade in the dexmedetomidine group than in the clonidine group without any adverse effects. Dexmedetomidine and clonidine are both α2 selective agonists. It is possible that they work in a similar manner and may indicate a class effect. However all studies carried out so far to prove the peripheral action of α2 agonists were animal studies. There are very few human studies, i.e. greater palatine and axillary brachial plexus nerve blocks have subsequently demonstrated that increased duration of sensory blockade can be achieved by adding dexmedetomidine to bupivacaine and levobupivacaine, respectively. , Keeping these facts in mind, we decided to compare the action of two α2 agonists, i.e. clonidine and dexmedetomidine with bupivacaine in lesser concentration (0.25%), in peripheral nerve blocks so that by increasing the duration of analgesia with a single shot block we can achieve a longer duration of post-operative analgesia without significant clinical side-effects and hence we can avoid continuous catheterization. Although dexmedetomidine has a α2 /α1 selectivity ratio that is eight-times higher than that of clonidine, an equipotent comparative study of both the drugs in peripheral nerve block was not available at the time of our study. The dose selection was based on previous studies where dexmedetomidine 1 μg/kg and clonidine 1 μg/kg were used in Bier's block as an adjuvant to lignocaine. After literature review, we found that dexmedetomidine and clonidine had peripheral action, which may be useful in using a lesser concentration of local anaesthetic (0.25%) to prolong the block with adequate anaesthesia. This in turn may be beneficial in high-risk patients. In our study, we compared the addition of clonidine (Group C 1 μg/kg) and dexmedetomidine (Group D 1 μg/kg) to bupivacaine in supraclavicular brachial plexus block. The result of our study shows that all patients in both groups were comparable with respect to demographic profile, duration of surgery and type of surgery. 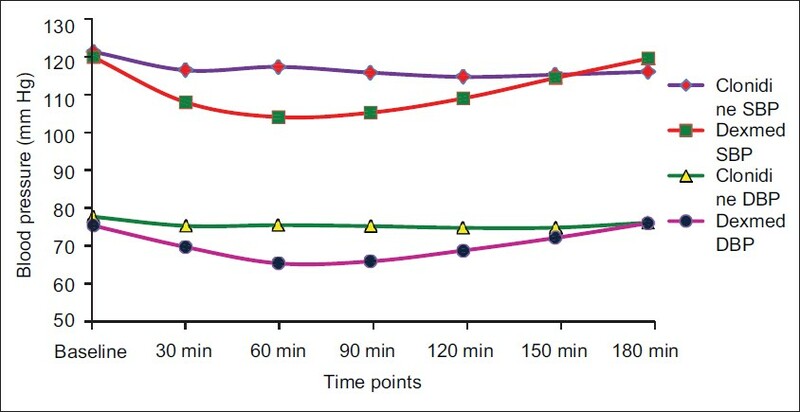 With these doses, we had stable haemodynamics in patients except significant lower pulse rate in Group D at 60, 90 and 120 min as compared with Group C, but not less than 60 beats/min. Esmaoglu et al. added dexmedetomidine to levobupivacaine for axillary brachial plexus block and showed that it shortens the onset time of both sensory and motor block, prolongs the duration of block and the duration of post-operative analgesia. This may be because peripheral α2 agonist produces analgesia by reducing release of norepinephrine, leading to α2 receptor-independent inhibitory effects on nerve fiber action potentials. , However, in our study, we found that onset of sensory block was a little faster with Group D as compared with Group C, but it was statistically insignificant, while onset of motor block was a little longer in Group D but again not significant statistically. The duration of analgesia in Group D was longer than in Group C, and it was statistically significant. The concern of prolongation of motor block. was minimal patient discomfort on movement in the post-operative period. Memis et al. in their study showed that addition of dexmedetomidine to lignocaine for intravenous regional anaesthesia improves both the quality of anaesthesia as well as intraoperative and post-operative analgesia. In our study, the quality of block in 80% of the patients in Group D was grade IV, i.e. excellent block without any supplementary sedation or analgesia, while 40% in Group C achieved grade IV quality. This improved quality of block might be the result of various mechanisms of nerve conduction block such as hyperpolarisation,  decreased CAP  and inhibition of voltage gate of sodium pump. The major limitations of our study are that we did not use ultrasound-guided blocks because of unavailability at the time of our study; this could have helped us to lower dosages and volumes of local anaesthetic. In spite of an intensive search of the published literature, we were unable to identify an ideal scale for assessment of quality of block achieved. While the higher cost of dexmedetomidine can be suggested as a reason for preference for clonidine, the increased requirement of supplementary analgesia and sedation with clonidine may balance this. We admit that further studies to determine the cost-effectiveness of the drug are necessary. From this study, we would like to suggest that dexmedetomidine can be safely used with local anaesthetic in peripheral nerve blocks; however, further trials to determine the exact dose and effect of neurotoxicity on the human nerve are required. To conclude, we would like to state that dexmedetomidine prolongs the duration of sensory and motor block and enhances the quality of block as compared with clonidine when used as an adjuvant to Bupivacaine in peripheral nerve block. 1. Damien B, Murhy, Collin JL, Cartney, Vincent WS. Novel analgesic adjuvants for brachial plexus block: A systemic review. Anesth Analg 2000; 90:1122-8. 2. Elliott S, Eckersall S, Fliqelstone L. Does addition of clonidine affect duration of analgesia of Bupivacaine in inguinal hernia repair. Br J Anaesth 1997;79:446-9. 3. Singelyn FJ, Gouveineur J, Robert A. A minimum dose of clonidine added to mepivacaine prolongs duration analgesia after brachial plexus block. Anesth Analg 1996;83:1046-50. 4. Popping DM, Elia N, Marret E, Wenk M, Tramèr MR. Clonidine as an adjuvant to local anaesthetic for peripheral nerve and plexus blocks: A meta-analysis of randomized trials. Anesthesiology 2009;111:406-15. 5. Raimo V, Juha M, Veijo S, Leena N, Virtanen R. Characterisation of selectivity, specificity and potency of medetomidine as α2 adrenoceptor agonist. Eur J Pharmacol 1988;150:9-14. 6. Keniya VM, Ladi S, Naphade R. Dexmedetomidine attenuates sympathoadrenal response to tracheal intubation and reduces perioperative anaesthetic requirement. Indian J Anaesth 2011;55:352-7. 7. Brummett CM, Norat MA, Palmisano JM, Lydic R. Perineural administration of dexmedetomidine in combination with Bupivacaine enhances sensory and motor blockade in sciatic nerve block without inducing neurotoxicity in rat. Anesthesiology 2008;109:502-11. 8. Brummett CM, Amodeo FS, Janda AM, Padda AK, Lydic R. Perineural dexmedetomidine provides an increased duration of analgesia to a thermal stimulus when compared with a systemic control in a rat sciatic nerve block. Reg Anesth pain Med 2010;35:427-31. 9. Brummett CM, Hong EK, Janda AM, Amodeo FS, Lydic R. Perineural dexmedetomidine added to ropivacaine for sciatic nerve block in rats prolongs the duration of analgesia by blocking the hyper polarization-activated cation current. Anesthesiology 2011;115:836-43. 10. Kosugi T, Mizuta K, Fujita T, Nakashima M, Kumamoto E. High concentrations of dexmedetomidine inhibit compound action potential in frog sciatic nerve without α2 adrenoceptor activation. Br J Pharmacol 2010;160:1662-76. 11. Kanazi GE, Aouad MT, JAbbour- Khoury SL, Al Jazzar MD, Alameddine MM, Al-Yaman R, et al. Effects of low dose Dexmedetomidine or clonidine on characteristics of spinal block. Acta Anaesthesiol Scand 2006;50:222-7. 12. Memis D, Turan A, Karamanlioglu B, Pamukçu Z, Kurt I. Adding dexmedetomidine to lignocaine for IVRA. Anesth Analg 2004;98:835-40. 13. Esmaoglu A, Yegenoglu F, Akin A, Turk CY. Dexmedetomidine added to levobupivacaine prolongs axillary brachial plexus block. Anaesth Analg 2010;111:1548-51. 14. Obayah GM, Refaie A, Aboushanab O, Ibraheem N, Abdelazees M. Addition of dexmedetomidine to Bupivacaine for greater palatine nerve block prolongs postoperative analgesia after cleft palate repair. Eur J Anaesthesiol 2010;27:280-4. 15. Sarkar DJ, Khurana G, A Chaudhary, J P Sharma. A comparative study on the effects of adding fentanyl and buprenorphine to local anaesthetics in brachial plexus block. Journal of Clinical and Diagnostic Research 2010;4;6;3337-43. 16. Ramsay MA, Savage TM, Simpson BR, Godwin R. Controlled sedation with alphaxolone-alphadolone. Br Med J 1974;2:656-9. 17. Dalle C, Schneider M, Clergue F, Bretton C, Jirounek P. Inhibition of the I (h) current in isolated peripheral nerve: A novel mode of peripheral antinociception? Muscle Nerve 2001;24:254-61. 18. Abosedira MA. Adding clonidine or dexmedetomidine to lignocaine during Biers block: A comparative study. J Med Sci 2008;8:660-4 (Doi:10.3923/jms.2008.660-664). zhang, x. and bai, x.
fritsch, g. and danninger, t. and allerberger, k. and tsodikov, a. and felder, t.k. and kapeller, m. and gerner, p. and brummett, c.m. agarwal, s. and aggarwal, r. and gupta, p.
babu, m.s. and verma, a.k. and agarwal, a. and tyagi, c.m. and upadhyay, m. and tripathi, s.
Ip, V.H.Y. and Tsui, B.C.H.